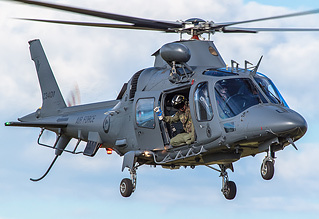 The Royal New Zealand Air Force 75th Anniversary show was just one of a number of events being held in New Zealand between January and April to celebrate the RNZAF's 75th birthday. 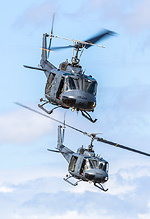 The show was held at the RNZAF's Base Ohakea, located 14 miles west of Palmerston North on New Zealand's North Island, which is one of only two operational RNZAF air bases in New Zealand. It's currently home to the Central Flying School, No.3 Sqn (Iroquois and Sioux) and No. 42 Sqn (King Air B200s). Keith Meachem made the long journey south to join the Birthday celebrations. All photography by the author. The crowd for the show was estimated to be in excess of 60,000 people. It would have been even larger, had it not been for traffic management problems that caused severe congestion outside the base. Fortunately we'd arrived at the base gate at 07:00, so got in without any delays. The crowd line was to the north of the runway, with the sun being behind the crowd until late in the day. Considering the distance involved, the show was well supported by the USAF, USMC, Singapore Air Force and French Armed Forces, who all brought aircraft down to Ohakea. The largest contingent though was from the RAAF, consisting of a B737 Wedgetail, C-17,C-130J and five F/A-18s. All of the visiting crews allowed access to their aircraft, with long queues forming from early in the day to get on board. The longest queue of the day though was for Air New Zealand’s "All Blacks” 777-319 ER (ZK-OKQ) that had been flown in especially for the show. The flying display started at 10:00 with an ex-RAF/ex-Singapore Hunter FGA9 and concluded with the Red Checkers at 15:30. 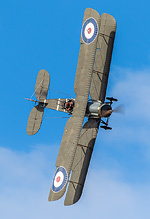 Unlike some shows there was no break for lunch, so it was 5½ hours of continuous flying. The air show included a mixture of both old and modern aircraft, from a very spirited dogfight between a Bristol Fighter & Fokker DVII, through to current front line combat aircraft including the RAAF's F/A-18 and USAF's C-17. As you'd expect the theme throughout the show was the RNZAF. 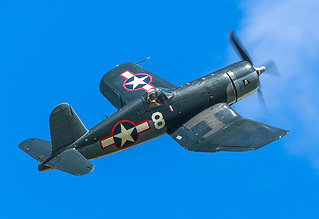 WWII aircraft were well represented with a couple of Spitfires, a P-40 Kittyhawk, a Corsair and, new to the New Zealand air show scene, a Grumman TBM Avenger. Most the RNZAF's current types including the Sioux, Iroquois, A109, Seasprite, P-3 Orion and 757 displayed. 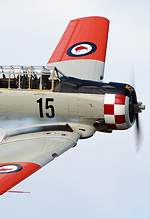 The show was well served by display teams, with the RNZAF's Red Checkers, the Yakobatics (Yak 52s), the Roaring 40's Harvard team and the RAAF's four-ship F/A-18 display team all displaying. 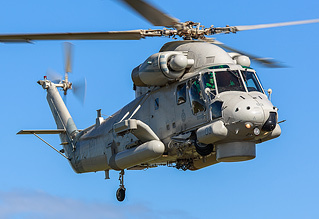 An unexpected highlight of the show was seeing the first public flying display of the RNZAF's NH90 which is still undergoing Operational Testing and Evaluation (OT&E) at Ohakea. It was a fitting way for the RNZAF to celebrate their 75th birthday.